No matter how grieved, empty, devastated, saddened and traumatized we feel over the loss of the three Jewish teenagers, we do not feel as bad as the parents do. We still have within us the hope that it will not happen to our very own, a prayer now tragically denied the Fraenkel, Shaar and Yifrach families. There simply is no way to compare the utter pain and destruction felt by those families to our own very deep feeling of loss. This is natural. It is the way the human brain works. No matter how much we struggle with the senseless murder of Mohammad Abu Khdeir, we do not struggle as we do over the loss of Eyal, Naftali, Gilad and Shelly Dadon. This too is natural and this too is the way the brain works. Human genetics are somewhat tribal. First immediate family, then distant family, then one’s genetically related nation and then the more distantly related rest of humanity. While there are several theories attempting to explain why this is the case and what advantages this tribal association bestows upon humanity, it is still a conundrum. That makes this phenomenon no less real, however. To deny this is to confuse an already confused brain and will bequeath no greater level of morality to the denier. It is possible to reprimand in the strongest terms and to punish to the fullest degree the perpetrators of the murder of the Arab youth from Shuafat; it is not possible, however, to shed for him the same tears as we do for our own murdered youth. Although many have tried, these tears are more related to our crocodile ancestors than to the very real tears that people shed for the murdered Israeli youth. Why is this important to understand? It is of the utmost importance because the attempt to live beyond our own biological and specifically, neurological, means is ultimately suicidal, by definition. No matter how hard many Jews try to deny it, the simple fact is that the human brain is not entirely cerebral. As a matter of fact, many scientists of neurobiology and of psychology would argue that the human brain is not even chiefly cerebral. Our brains are a generational repository of personal and national history, genetics, education, culture, nutrition and a host of other factors. People experience jealousy, agony, happiness, love and yes, even feelings of revenge. All of these emotions factor into the final output of our actions, guiding our higher levels of thought into rationalizing whatever conclusion we reach. The trick is to not deny and to not betray all of the levels of brain function, but rather to understand as well as possible the different inputs and to attempt to live in accordance. This is difficult in Israel, under the circumstances. Nevertheless, to be dishonest about all of our emotions is to block these emotions from their God given purpose (or, for those that are uncomfortable with the last phrase, from their biological purpose of sustainability). It has always struck me as strange that the most unnatural emotional responses I have heard over the murder of Mohammad Abu Khdeir come from the same people who are huge advocates of “being in touch with one’s self”. Really? We are at war. The brain at war functions differently than the brain at peace. It not only controls our heart rate and organs differently, but it draws conclusions different from those of a person or nation not under attack. That is how people and nations survive in this vicious world. For all those unnatural humanists out there, please try to be in touch a bit more with your inner selves. Trying to outgrow our tribal tendencies may (or, may not) be a noble venture, but trying to deny them is simply a futile, dangerous and dishonest exercise. There has to be a balance – and now, these days especially – is no time to lose that balance. 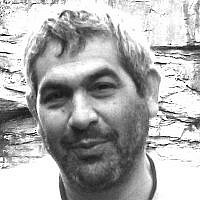 Asher Keren writes about science and philosophy, is an author and religious settler who has lived in Israel for over thirty years.